You can send the invoice via email using the Send Email option. Using the Update Invoice Address option, you can change the billing and shipping addresses for individual invoices. This action will only change the address details linked to the particular invoice and not the billing or shipping address linked to the customer or subscription. If you have enabled the taxation feature for your site, the region cannot be changed using this option if the tax rate calculated is dependent on the location, as the tax rate applied would change. More on Chargebee's taxation feature here. Using the Collect Now option, you can collect full or partial payment for an invoice. Using the Record Payment option, you can manually record offline payments received for invoices which are in Payment Due or Not Paid state. While recording the payment, enter the amount collected in the Amount field. The partial amount is deducted from the total amount of the due invoice. The invoice remains in Payment Due or Not Paid state until the entire due amount is recorded. You can record the amount paid by the customer which is in excess to the invoice amount. The Record Payment option can also be used to record the amount received in excess of the amount due. Once the excess amount has been recorded, it will be added as an Excess Payment at the customer level. This will then automatically be applied to the future invoices. It can also be manually applied to the existing Not Paid or Payment Due invoices. Using the Apply Payments option, you can apply excess payments manually on invoices. Excess Payments are present for the customer. The invoice is in Payment Due or Not Paid state. Use the Remove option to remove the payment applied to an invoice. Auto collection is ON, the invoice status will change to Not Paid and the amount due will be increased. Auto collection is OFF, the invoice status will change to Payment Due and the amount due will be increased. Once the payment is removed from a Payment Due or a Not Paid invoice, the amount due will be increased but the invoice status will remain the same. The Remove option will not be available if the invoice has been partially or fully refunded. The Apply Credits option allows you to apply Refundable Credits that are present for a particular customer to the invoice. Refundable Credits are present for the customer. When this operation is selected, a list of the available Refundable Credits will be shown and the preferred credit can be chosen to be applied to the invoice. Using the Refund option, you can issue refunds for paid or partially paid invoices. More on issuing refunds via the web interface here. If you've collected offline payments and need to refund the same, use the Record Refund option. More on refunding offline payments here. If you would like to return an amount to the customer but would like to retain the same in the form of credits, you could use the Create Credit Note operation. PO Number was not entered while creating a subscription. The PO Number has been modified and needs to be updated in the older invoices. This action will only change the PO number linked to the particular invoice and not the PO number linked to the subscription. If the invoice's due amount was not collected even after multiple attempts, the Write Off operation can be used to close the invoice. An Adjustment Credit Note will be created for the invoice due amount. This Credit Note will have the reason code as "Write Off" and will then be applied to the same invoice. The invoice's status will be marked as Paid. The customer requests for a change in the invoice. The customer cancels the order. An invoice cannot be voided if it has payments associated with it. The Void option will be available only for the roles of Owner, Admin, Sales Manager, and Customer Support. If Promotional Credits had been applied to a voided invoice, the credits will be reclaimed and added back to the customer. If Prorated Credits had been applied to a voided invoice, the credits will be reclaimed and added back to the subscription. If the current term's invoice is voided and if the subscription is changed with the option Apply prorated credits and charges enabled, then Prorated Credits will not be created for that subscription and will not be applied for subsequent invoices. Voiding an invoice will trigger the invoice_updated event. The voided invoice can be regenerated after correcting the invoice details. This option is used to permanently delete an invoice. The Delete option will be available only for the roles of Owner and Admin. If Promotional Credits had been applied on a deleted invoice, then the credits will be reclaimed and added back to the customer. If Prorated Credits had been applied on a deleted invoice, then the credits will be reclaimed and added back to the customer. If the current term's invoice is deleted and if the subscription is changed with the option Apply prorated credits and charges enabled, then Prorated Credits will not be created for that subscription and will not be applied for subsequent invoices. Deletion of an invoice will trigger the invoice_deleted event. If an invoice is deleted, it is removed from the system and the operation cannot be undone. If you are filing for taxes, deletion of invoice might be problematic because you will lose record of the invoice number sequence. For example, if an Invoice #002 is deleted, the list of invoices would then be #001, #003, #004, #005, and so on. If an invoice is voided, on the other hand, the invoice status will be marked as Voided but the invoice would still be available in the system. Regenerate invoice option allows you to create the invoice for the subscription, again, for the current term. When will you regenerate the invoice? Scenario 1: In case you have missed adding a coupon to the subscription or if the taxes have been applied incorrectly, you can utilize the Regenerate Invoice option. So when an invoice is generated with incorrect amount, coupons, taxes, shipping/billing address etc., you may void the invoice and correct the invoice. After the corrections are made, you can regenerate the invoice with accurate details. Scenario 2: If the subscriptions are imported into Chargebee (via API), invoices will not be created automatically. In this case, you can create an invoice using the Regenerate Invoice option. 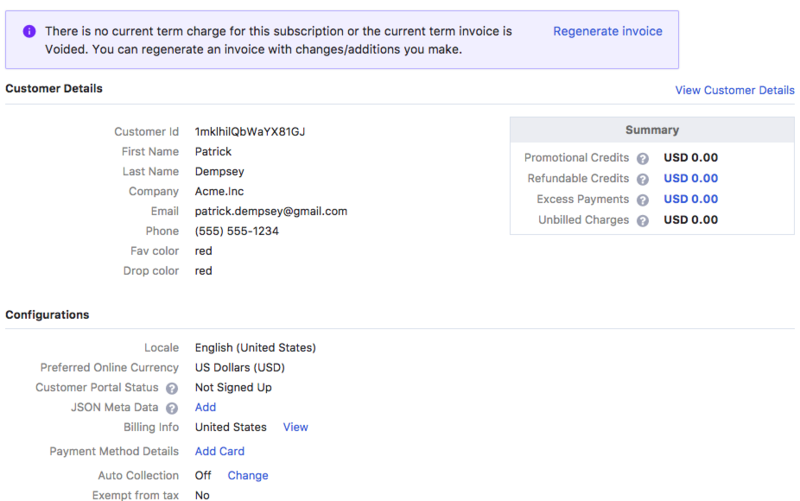 Step 1: Search for a subscription and select the Regenerate Invoice option. Custom Period - select a specific period for which you want to regenerate the invoice. The set up fee of a plan does not appear in the line items of the regenerated invoice. If you had enabled the option to hide zero value line items in your site settings, an invoice will not be generated even if the subscription is in Active state. In such cases, you do not see the option to regenerate the invoice. This option is available when you have enabled dunning, and only for Payment Due invoices. The Stop Dunning option will only stop the dunning process and cancel all the scheduled retries for the invoice. However, the subscription will continue to remain Active and the invoice will be marked as Not Paid, irrespective of your dunning settings. You can download the invoice as pdf copy for local reference. If you need to download invoices in bulk you can do that as well. Navigate to Invoices tab and use the Export as PDF option. You can also set the criteria using the filters and download those invoices. When downloading multiple invoices, the PDF files will be mailed to you as an attachment. Each PDF file will contain a maximum of 50 invoices, one on each page. So for example, if you're downloading 80 invoices, you will receive 2 separate emails, one with 50 invoices and the other with 30 invoices. The Invoice Notes option allows you to add additional notes to the invoices. Invoice Notes can be setup specific to each customer or subscription. It can also be set up at a Plan, Addon, or Coupon level, to ensure they are included only when that specific item is part of the Invoice. You could also use the Invoice Notes option (Settings > Configure Chargebee > Invoices, credit notes and quotes > Invoices tabInvoices, credit notes and quotes) to add a default note for all invoices. More on Invoice Notes here. To include one-time charges, use the Add Charge Item option. This option is available for invoices in Pending status. Use the Add Addon Item option to include an addon in the invoice. This option is available for invoices in Pending status. If you have enabled metered billing in Chargebee, invoices will be generated in Pending status. Use the Close Now option to add the usage based charges and Chargebee will change the invoice status from Pending to Payment Due. You can also perform operations related to invoices using the Invoices API . How do I correct the details of an existing invoice? You need to navigate to the respective resources (Customer, Subscription, Plan, Addon, and Coupon) and make the changes. For instance, if the invoice has incorrect shipping or billing address, you need to change it in the respective subscription or if an invoice has incorrect tax details, navigate to Settings > Configure Chargebee > Taxes and change the tax configuration. Will the invoice number change when you regenerate an invoice? Yes, the Invoice number will be different when you regenerate invoice for the subscription. How do invoice operations affect orders in Chargebee? Refer to this section on the Chargebee Orders page. Can I send a quote to a customer and later convert it into an invoice? Yes, learn more about quotes and proforma invoices in Chargebee.